All about the best team in the land and all the world Manchester City!!! : News catch up! Eto'o deal off! City have pulled the plug on the Eto'o deal because the player was taking to long to make his mind up. Although it is a shame that Eto'o will not be a City player, I am glad we are not accepting being messed around. Jo goes back to Everton! Jo has joined Everton on a season long loan deal with the option of a permanent transfer. I would have liked to see Jo stay at City this season and fight for his place, Hughes obviously does not like him though. Gelson leaves for France! 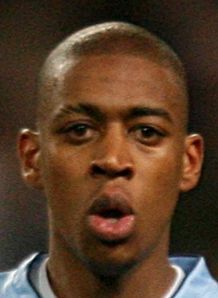 Gelson Fernandes has left City to join A.S. Saint-Étienne, Fernandes made no secret of his desire to go in search for regular football and will now hope to do that at the French Club. I am a little sad that Gelson has left, I was one of a small minority that liked Gelson as a player. Although sometimes brash in his approach I thought we had a good hard working player with bag fulls of potential. Micah has swine flu! Micah Richards has been diagnosed with swine flu. Micah was on holiday in Cyprus when he found out he had contracted the virus, he is currently being treated but will not be allowed back into Britain until he is fully cured. Hopefully it will only be a short time before he is better. Eto'o was playing games to see could he get A.C. or Manure move think its like a house of cards falling down now he a great player but seems to have a hugh Ego by the way he going on I'd sat Barca are eager to get rid. A typical quiet week in the City madhouse, eh?! ?